Check to show the calculation results. Uncheck to hide the results and only display the entered expressions. 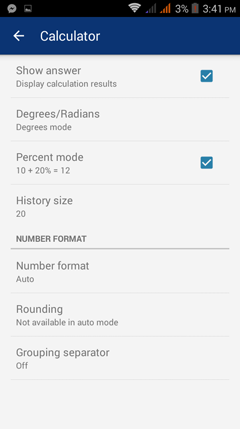 Enables percent mode for addition and subtraction. Enables you to change the history size from a minimum of 5 to a maximum of 100 entries. Switch between degrees and radians. This setting does not affect graphs and tables. Auto - automatic format - integer/fraction/decimal. Switch between rounding modes, i.e. the number of decimal digits after the decimal point and the precision of results. Rounding Mode – ceiling, floor, half down, half to even, half to infinity, half to odd, half to zero, half up and truncate. Switch between one separator format to another. Separator formats available are: Apostrophe, Comma, Space and Underscore.